WLE delivers sustainable agriculture solutions that enhance our natural resources – and the lives of the people who rely on them. Agriculture is a major driver of environmental degradation and social inequity. More than 70% of global freshwater is used for food production, while 25% of the world‘s land is already, or is on the way to being highly degraded. Such environmental losses undermine agricultural productivity as well as resilience to climate change. The most negative impacts often hit the poorest and most vulnerable smallholder farmers, especially women. At the same time, global food demand by 2050 is projected to increase 60% or more over 2006 levels. But current production systems risk our future. And too often, new solutions create or intensify other challenges. Without considering the interconnectedness of agriculture, short-term wins may contribute to long-term failure. In response to these intractable challenges, WLE identifies and pilots agricultural and natural resource management solutions that enhance equity and sustainability. This is an ambitious and wide-ranging agenda, but a vital one. WLE works to transform agricultural food systems, delivering solutions that do not cause degradation, but drive the cure. Through connected thinking and compelling solutions, WLE’s research-for-development work considers not only the field, but also the landscape and system level impacts of agriculture: how decisions around soil, water, biodiversity and people interact and impact the big picture. WLE is developing a growing portfolio of policy and technical solutions across sectors and scales. These connect and consider key ecosystems and natural resources: land, water, biodiversity; and how to manage these better to ensure we connect rural/urban environments, deliver gender equity, manage risks and trade-offs, and build capacity of farmers and decision-makers to develop and implement integrated solutions. 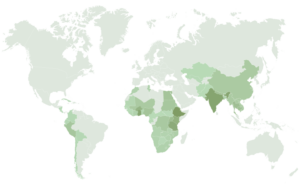 WLE is led by the International Water Management Institute (IWMI), and is supported by the CGIAR System Organization, a global research partnership for a food-secure future. The program combines the resources of 11 CGIAR centers, the Food and Agriculture Organization of the United Nations (FAO), the RUAF foundation, and numerous national, regional and international partners. Through these partners, the program provides evidence and solutions that can influence decisions on how agricultural interventions and investments are made. Degraded landscapes restored: WLE aims to support more than 1.5 million farm households to restore more than 3 million ha of land, and sequester in soils an estimated 4 megatons of CO2 emissions per year. Land and water solutions adopted and scaled: WLE aims to foster more resilient, equitable and food-secure farming landscapes, benefiting 2 million households, as well as improving water use efficiency at scale, targeting a 5% increase in efficiency in irrigation. Sustainable rural-urban ecosystems: WLE aims to increase water and nutrient-use efficiency on 4 million ha of urban and periurban lands, and improve nutrient- and wateruse efficiency on 3.6 million ha through resource recovery from food waste. Resilience through policy and trade-off tools: WLE co-develops and scales innovative policy mechanisms and institutional arrangements, aiming to benefit six million households by 2022.